Babcock Labs in the Community: Drinking Water Treatment Partnership Project Helps Hundreds of Underserved Coachella Valley Residents — Babcock Laboratories, Inc. The Drinking Water Treatment Partnership Project was established in the spring of 2013 as a means of addressing the need for clean drinking water in low-income mobile home parks located throughout the Eastern Coachella Valley. Through the various contributions of the involved partners, this project has provided, and continues to provide, installation of water treatment systems (reverse osmosis units) to underserved mobile home communities that have high levels of arsenic and/or fluoride in their raw water sources. From there the project truly became a group effort. When it was determined that the mobile home park communities in question were too small and lacked sufficient resources to connect to a different water source or receive a grant to do so, DEH and the Rotary Club of La Quinta sought out an alternative solution. They called on the local community to provide the proper funding and resources necessary to provide the mobile home parks with water treatment systems. The Desert Alliance for Community Empowerment (DACE) and Pueblo Unido, along with a few other nonprofit community organizations, assisted with the cost of installing the treatment systems. Through the incredible outreach efforts of the La Quinta Rotary Club, donations were also made by other Rotary Clubs, including clubs in Canada, as well as by Rotary International. Babcock Laboratories volunteered its services and provided both pre- and post-treatment drinking water analyses of the various water sources. Babcock Labs will continue to work with DEH and provide sample analysis to ensure that the arsenic and fluoride levels remain within safe drinking water standards. Riverside County DEH worked with the county’s Board of Supervisors’ 4th District Office to evaluate and select water system recipients. Recipients were chosen based on their lack of existing water treatment, their fluoride and arsenic levels, and the responsiveness of the park’s owner(s) to maintain the treatment system. 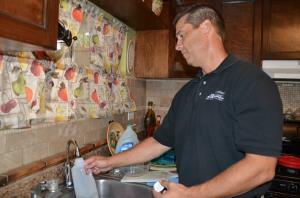 “I am always looking for ways to assist my residents and help them save money,” said Ana, co-owner of one of the mobile home parks whose residents now enjoy clean drinking water from a spigot attached to a reverse osmosis unit beneath their sinks. Before Ana’s mobile home park became involved with the project, the only treated water source available to the residents was an outdated treatment system housed in a small shed located at one end of the property. Residents had to fill up jugs of water in the shed and bring them back to their homes in order to have clean water to drink and cook with. “The old treatment system wasn’t conducive to our residents’ well-being, as some individuals who live here are severely disabled and others have very small children who don’t understand the difference between raw and treated water,” explained Ana. 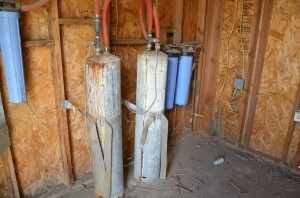 Each mobile home park has about 10 to 12 service connections which classifies them as “State Small Water Systems”. For the parks with arsenic concentrations, arsenic levels in the untreated water were as high as 13 to 44 parts per billion (ppb). However, after installation of the water treatment systems, the arsenic levels in the treated water were either ‘none detected’ or much lower than the state and environmental regulations requiring an MCL of 10 ppb for arsenic. The total cost per water treatment system is $350, a large expense for low-income families. Fortunately, thanks to the Drinking Water Treatment Partnership Project, it is not an expense the residents in these remote, underserved mobile home communities have to endure. For more information about the Drinking Water Treatment Partnership Project, contact Riverside County DEH Deputy Director John Watkins at jwatkins@rivcocha.org.